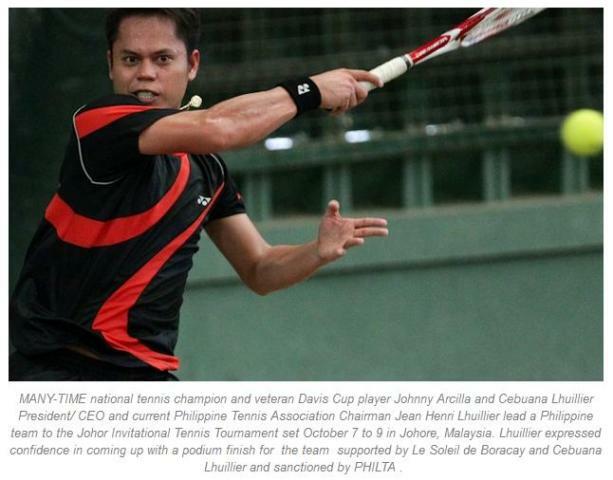 NINE Philippine tennis supporters and players are off to Malaysia to compete at the Johor Invitational Tennis Team Competition 2016 this Oct. 7 to 9 at the Academy Tennis Johor. Team Le Soleil de Boracay, the only delegation from the Philippines, is going up against groups from Malaysia and Indonesia for the men’s doubles with combined ages of 80, 90 and 100 categories. Led by Philippine Tennis Association Chairman and Philippine sports patron Jean Henri Lhuillier, Philippine Columbian Association Tennis Open eight-time champion Johnny Arcilla and PHILTA officials Randy Villanueva and Gerard Maronilla, the group is joining 19 other teams in the tournament. Manuel Suarez, Jackie Tomacruz, Rolly Oliquino, Henry Escalante, and Andrian Raturandang complete team Le Soleil de Boracay. “Our team has a great chance of bringing home the championship trophy since every single member is passionate about tennis and determined to win. But aside from competing, we also take this tournament as an opportunity to build good relationship with other tennis enthusiasts in Asia,” said Jean Henri Lhuilier. Other participants in the tournament include STF Tennis Team, Kota Kinabalu Bugzz and Wilson Meerkats from Malaysia, and Padang Tennis Club, Pemko Batam Tennis Club, and Duta & Friends Tennis Club from Indonesia.